Please bring in a hard plastic container, such as a milk jug, detergent jug. Tape top with duck tape if the top doesn’t screw on. BRING IN TO THE OFFICE. 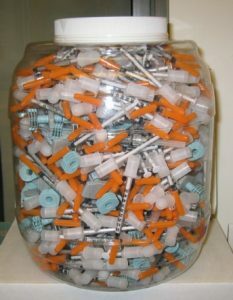 There is legislation pending in NH to require Doctor’s Offices and Pharmacies to take back used needles. Check back for updates.